From the 1st November 2010 the cities of Auckland, Manukau, North Shore and Waitakere plus the towns within the Franklin, Papakura and Rodney Districts combined to form Auckland City; this has amalgamated the 55 libraries within the Auckland region and are now known as Auckland Libraries. As residents we can now use our library card at any one of the Auckland Libraries, accessing approximately 3.5 million items, fees and loan periods are consistent across the 55 libraries and membership is free with no joining fee. How brilliant is that! I’m so chuffed I thought I would write something about my library beginnings. I credit my parents completely for my love of books. As early as I can remember books were not a luxury in our house, they were a cornerstone, and while it must have been a financial juggling act at times – keeping five children supplied with books – it certainly wasn’t noticeable to us. My mother had become canny at keeping ahead of us; she would buy books all year round and stash them away for the right occasion. There was always a book, or several, for Christmas and birthdays. The permanency in one’s life of certain books has also been inherited; maybe they are classics, they inspire or educate, have artist merit or just look great, some simply because they have sentimental value. There are some books one should just have always – and never part with – and nobody appreciated this permanency more than my mother, for my 21st birthday she gave me a collection of AA Milne’s Winnie the Pooh series! 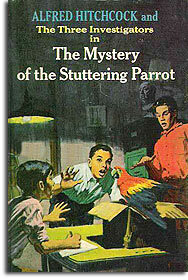 A 1958 article in Encounter by Colin Welch, directed against the Noddy character, was reprinted in a New Zealand librarians’ periodical. 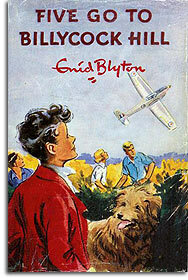 This gave rise to the first rumour of a New Zealand ‘library ban’ on Blyton’s books, a recurrent press canard. It is rather ironic then that years later the article should encourage the removal of Blyton from some library shelves; in a country renowned for its social welfare. I always thought it was a race issue in New Zealand; Golliwogs however innocent are not the kind of inspiring character for a country also renowned for its pursuit of racial equality. I suspect the statement ‘a recurrent press canard’ in reference to Welch’s article may be accurate, at best his opinion piece may have contributed to the Blyton ban, I believe however that the fervent embargo of Blyton’s work by the BBC was probably more of an influence on us and consequently the unavailability of Blyton in New Zealand’s public access institutions. This Enid Blyton ban was certainly a reality at the Rotorua library, when I inquired where I could locate any of the Famous Five series I can recall the librarian dismissing their availability with an off-hand, “no longer in circulation”. I have a feeling Biggles went into storage about this time too (now this time it was a race issue?). With my mother’s help however these books were supplanted by Alfred Hitchcock’s The Three Investigators series, I devoured the lot. At some point I started to take notice of my mother’s library books. 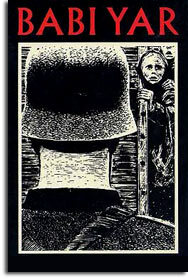 Reading her borrowed copy of Anatoly Kuznetsov’s Babi Yar ultimately took me away from the child’s section; Hammond Innes and John Buchan secured the transition to the adult section. Now there was a whole new world to read about, but what a book to start with, Babi Yar is a harrowing document, but I do remember enjoying reading it as much as I relished the new perspective on ‘worldly’ events it gave me. I realize now how great an influence it has had on what are my favourite books today: history, social politics and military non-fiction. The Rotorua library began life in the lakeside village of Ohinemutu in 1898, the building had originally been a store and then a schoolroom before being converted to a reading room with 335 lending books and supplying “home and colonial newspapers, periodicals and review magazines.” Visitors were given free use of the library but residents had to pay a subscription of one pound a year. In 1890 the library was registered under the Public Library Powers Act of 1875. In the years that followed the library building was in desperate need of repairs, fundraising and lobbying efforts were rewarded in 1897 with the laying of a foundation stone for the Victoria Institute, a combined library, reading room and museum. Named in recognition of Queen Victoria’s sixtieth year as monarch, the reading room was officially opened in 1898. 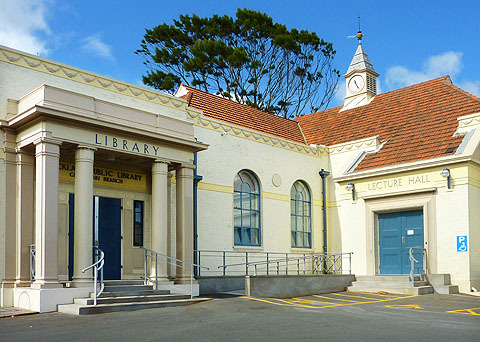 For the next 15 years Rotorua was under Government control and the library was sadly neglected. When Rotorua became a borough in 1923 the librarian Miss Benner reported that most of the books were old and lacked covers. I remember the Municipal Building as a lot of fun to visit as a kid, with its fountain courtyard in front, the theatre at the rear and in the middle – mirrored on either side of the building – the Library and the Council offices. The librarian’s counter had a duplicate in the council offices next door; both counters ran to the same dividing wall, as one stood in line on either side of the wall it was easy to imagine the two counters running together as if nothing separated them. My over-riding memory of inside the library was of the echo when walking on the wooden floor and the lush deep red of the wooden shelving. 1 Way of the World: Little Noddy: the debate rages by Craig Brown. 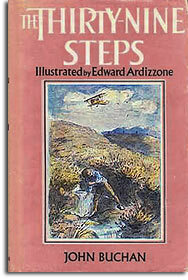 This entry was posted in Books, Bookshops & Libraries and tagged AA Milne, Alfred Hitchcock, Auckland Libraries, Babi Yar, Banned Books, BBC, Colin Welch, Enid Blyton, Grey Lynn Library, Growing Up with Books, Libraries, Rotorua Library. Bookmark the permalink.